Sanjay Lalbhai is the Chairman and Managing Director of Arvind Ltd, a 1.3 Billion Dollar Indian conglomerate. It is under his leadership that Arvind has become one of the largest manufacturers of textiles in the world and one of the largest brand-houses in India. Mr. Lalbhai also serves on the board of Adani Ports & Special Economic Zone Ltd. – one of India’s largest port-company. 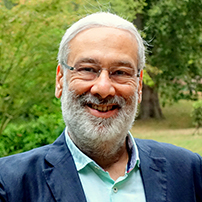 Mr Lalbhai believes that addressing societal concerns and creating long lasting benefit to society is integral to the business strategy and he provides leadership to several educational and research institutions. He is the President of Ahmedabad Education Society and Ahmedabad University, Chairman, CEPT University, Chairman of Council of Administration of Ahmedabad Textile Industry’s Research Association, member of the Council of Management of the Physical Research Laboratory and member of Board of Governors of National Institute of Fashion Technology.